Sam's Loan was founded in 1946 on Howard Street by Ruben Manes. For 25 years this pawn shop/jewelry store helped Akron's troubled rubber workers make it from payday to payday by providing affordable short-term loans. In 1971 Ruben sold the business to his son Lee, who moved the shop to its current location on East Exchange Street. It was during this time the focus shifted from loans to fine jewelry, growing Sam's Jewelry Emporium into a jewelry store with one of the largest inventories in Northeast Ohio. While Sam's still offers inexpensive loan options, they have become the go-to place for exquisite diamonds and jewelry. Lee Manes is the owner of Sam's Jewelry Emporium. Lee purchased Sam's Emporium from his father Ruben in 1971. With Lee's hard work and dedication he has transformed the business from a pawn shop into one of the largest most complete jewelry stores in northeast Ohio. "Sam's Jewelry Emporium success is based upon the fact that we are a value jewelry store and I am proud that we have been in business since 1946". Eddy Escudero is part of Sam's Jewelry Emporium jewelry design and manufacturing team. Eddy specializes in Sam's CAD/CAM design work and rapid prototyping. He is always designing new pieces of jewelry exclusively for Sam's along with custom jewelry for our customers. Eddy is also the stores website designer. Eduardo Escudero has been in the jewelry business for over 29 years, learning his skills from his uncle Sergio at an early age. Eduardo manages Sam's Jewelry Emporiums repair shop and manufacturing facility. He specializes in the design of jewelry, jewelry repairs, custom work, casting, setting and manufacturing. Eduardo has been with Sam's since 1994. 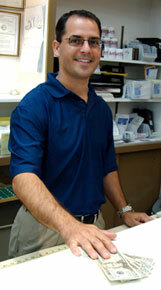 Jeff Meyers's career started while working in high school for Twin Valu at the jewelry counter in 1989. 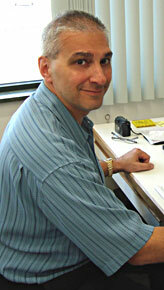 After Graduating from North High School in 1990, he attended the University Of Akron for business management. While attending college, Jeff took on a second job for Best Products as a bench jeweler. In January of 1991 he then left both jobs to start a career at Sterling Inc. where he started as a bench jeweler and progressed to a regional repair shop manager. August of 1998 Jeff decided to start his own jewelry business doing repairs and custom work that lasted until January of 2000 when he decided to take a position at Sam's Jewelry Emporium and is currently the loan manager. 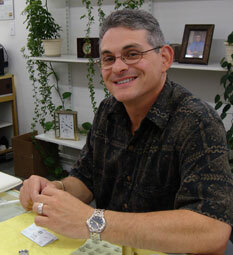 Jeff has always had a passion for jewelry and watches and is currently taking classes through G.I.A. to achieve his graduate gemologist diploma. 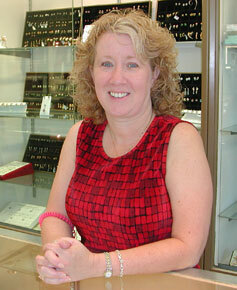 Gail Miller has been with Sam's Jewelry Emporium since 2006. Gail started out in the jewelry business in 1982 working for Macys' fine jewelry department. Gail is knowledgeable about gemstones and diamonds. Working part time for Sam's, Gail is always eager to wait on customers and make new friends. Curtis Post has been at Sam's Jewelry Emporium since 1997. Curtis attended Kent State from 1983-1987 earning a B.B. A. degree in marketing. He completed his Graduate Gemologist degree from the Gemological Institute of America in 2007 Curtis loves selling all types of jewelry with engagement rings being his favorite. "Being part of my customers' special occasions and developing lifelong relationships based on trust is my ultimate goal"
John Ruggiero has been involved in many aspects of the jewelry industry for over 30yrs. 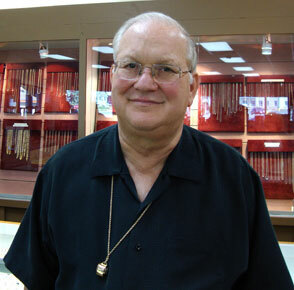 John completed his Graduate Gemologist degree from the Gemological Institute of America in 1986. He was brought up in the family jewelry business and has now been Sam's Jewelry Emporium manager since 2003. Robert School has been involved in the jewelry industry since 1975. 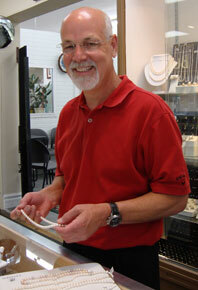 Bob has been part of the Sam's Jewelry Emporium team since 2007. "I love all aspects of the jewelry business, from simple watch repair to that special diamond purchase". Jeannette Janosi has been in the jewelry industry for over 19 years. 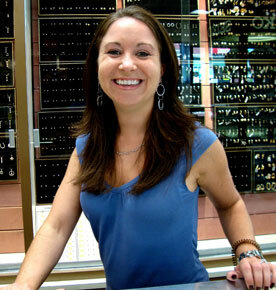 She has been at Sam's Jewelry Emporium since 2004. "Jewelry has been a passion of mine all my life. I can't help but love what I do." Jeannette is currently working towards her Graduate Gemologist degree.